Bob Saget is an American stand-up comedian, actor, and television host. 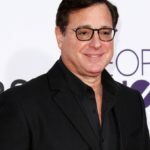 His television roles include Danny Tanner on the ABC sitcom Full House (1987–95) and its Netflix sequel Fuller House, and hosting America’s Funniest Home Videos from 1989 to 1997. Saget is also known for his adult-oriented stand-up routine. He also provided the voice of the future Ted Mos by on the CBS sitcom How I Met Your Mother from 2005 to 2014. Saget’s 2014 comedy album, That’s What I’m Talk in’ About, was nominated for the Grammy Award for Best Comedy Album. "Yet there are some people – Steve Allen would dissect comedy forever; he’s a really funny guy, but he would love talking about comedy. I’m doing it right now and you all seem bored." "I’m doing 5000 seat theaters and audiences are going nuts, it’s fantastic and it makes me very happy. I’m dirty, but not like this; I just do comedy that I find funny. I’m working on a new tv show for cable and it’s not set up yet." "It was a JOB; the video show was a JOB; you don’t tell the Aristocrats joke at 8 o’clock at night on network tv, it would be funny though. But those guys know I like dirty stuff, I like clean stuff too."